Storage Information: Like all grains, store barley in a tightly covered glass container in a cool, dry place, up to one year. Barley can also be stored in the refrigerator during periods of warmer weather. Food Fun Facts: Barley is a wheat free cereal grain but not gluten free. It is also the most acidic of grains. Barley is wonderfully versatile with a rich nutlike flavor and an appealing chewy, pasta-like consistency, the result of its gluten content. 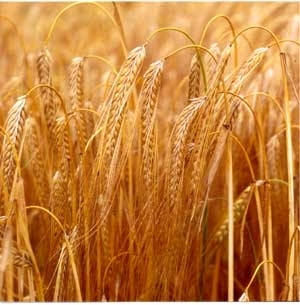 Its appearance resembles wheat berries, although it is slightly lighter in color. Sprouted barley is naturally high in maltose, a sugar that serves as the basis for both malt syrup sweetener and when fermented, as an ingredient in beer and other alcoholic beverages. Barley can be found in the market in various different forms: Hulled barley Hulled barley (the outermost hull of the grain is all that gets removed in this form. While this makes for a chewier grain that requires more soaking and cooking, it also makes for a more nutritious food. Hulled barley is also sometimes called "dehulled barley," and it is the one form of barley what would be considered whole grain), Pearl barley (outer hull is polished off, lower in nutrients), Pot/scotch barley (in between hulled and pearl barley), Barley flakes, and Barley grits. Hulled Barley is that which is being offered in the CSA share. This form of Barley takes quite awhile to cook, upwards of one hour per cup in 3 to 4 cups of liquid. Pre-soaking for several hours is recommended, and the soaked barley may be cooked in the same soaking water. Add barley to your favorite stews and soups to give them extra heartiness and flavor. Barley can be combined with lentils and other legumes or in any combination of vegetables. Combine cooked barley and healthy sautéed mushrooms for a pilaf with an Eastern European twist. In a large saucepan, heat 2 tablespoons olive oil over medium heat. Add 1 finely chopped onion and cook until translucent, about 6 minutes. Stir in 2 ½ cups of stock or broth along with ½ cup barley. Bring to a boil. Lower the heat, cover and simmer until the barley is tender, 30 to 40 minutes. Stir in up to 2 cups white beans and simmer for 5 minutes. Season with pepper, stir in chopped parsley and serve. 1. Bring 1 quart vegetable stock to a boil in a large saucepan. Add 1 ¾ cups barley and 1 stalk chopped celery. 2. Simmer over low heat for 25-30 minutes. Remove from the heat and set aside 2 tablespoons of barley. Chop the rest in a food processor until smooth (optional). 3. Heat 1 cup cream in a small saucepan to almost boiling. Stir in the barley puree with the reserved barley. 4. Season with salt and pepper. Serve hot. Heat oil over medium heat. Add carrots, onions and garlic; cook and stir 3 minutes. Add mushrooms; cook and stir 5 minutes or until tender. Add stock, barley, beans, bay leaves, sugar and thyme. Bring to a boil over high heat. Reduce heat to low. Cover and simmer 5 minutes. Add greens; simmer 10 minutes. Remove bay leaves; discard. Stir in vinegar. Season to taste with pepper sauce. Garnish, if desired with red bell pepper strips. This recipe serves/makes 8. If you don’t have both beans and greens available we recommend trying the recipe with just one of these ingredients.